Professor Gail Silverstein graduated from the University of Michigan, Ann Arbor, B.A. (1995); and UC Berkeley School of Law, J.D. (1999). After finishing law school, where she was awarded the annual public service award, Professor Silverstein was the recipient of a public interest fellowship sponsored by the firm formerly known as Pillsbury, Madison & Sutro to work on a special project advising federal disability benefits recipients on the legalities of returning to work. 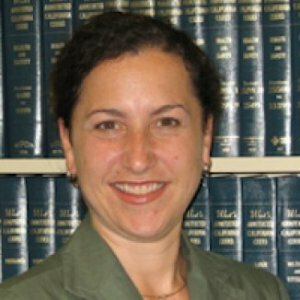 After her fellowship, Professor Silverstein joined East Bay Community Law Center (EBCLC), a community-based clinic of Berkeley Law and the largest provider of free legal services in the East Bay. During her tenure at EBCLC, she was a staff attorney and clinical supervisor in the HIV/AIDS unit, specializing in legal services to women and children in a variety of civil matters. In this position, she was also Chair of the Executive Committee of the Family Care Network, a multi-disciplinary group of AIDS service providers. At UC Hastings, Professor Silverstein co-directs and co-teaches Individual Representation Clinic and Mediation Clinic. She has litigated in the areas of state and federal public benefits, employment, housing, and “clean slate” law. She represents clients in state court and at state and federal administrative hearings. Professor Silverstein has also mediated hundreds of cases and has developed expertise in housing and employment discrimination and retaliation matters, workplace disputes, and small claims court matters. When not supporting students in their litigation and mediation skills, you can also find her working on scholarship and innovative pedagogical modalities regarding the attorney-client relationship and professional identity formation, being a faculty advisor, convening local Social Security disability representatives, and participating in the AALS Section on Clinical Legal Education and ABA Section on Dispute Resolution. Professor Silverstein is an active member of her community. She is an honorary director of the Berkeley Law Foundation, a post-law school public interest fellowship funder. In the recent past, Professor Silverstein served as the Chair of the Board of Directors of Women Organized to Respond to Life-Threatening Disease (WORLD), a women’s HIV/AIDS advocacy organization. She lives in Berkeley with her husband, two young children, and cat. She enjoys chocolate, podcasts, running and yoga. Presenter, "Effectively Managing Our Own and Our Students' Emotions in This Political Moment,"
This Article addresses a subject that has not received serious academic attention in law or in clinical scholarship: how lawyers should end their relationships with clients. As human beings, we intuitively understand the importance of endings in relationships, and lawyerclient relationships often impact both the lawyer and the client. Despite the amount of attention paid to other aspects of client interviewing and counseling, such as how to conduct an effective initial client interview, there is relatively little literature on how to achieve effective closure. This Article draws on research from the therapeutic professional field about how to effectively end professional relationships. Going beyond the minimal ethical considerations about how to end the lawyer-client business relationship, it derives a three-step model that can be used by practitioners and by clinical professors preparing their students for ending meetings with clients to help bring effective closure to the emotional and relational aspects of the representation. The cornerstone of live-client clinical legal education at UC Hastings is the in-house Community Justice Clinics (CJC). The CJC is the curricular umbrella for three separate courses and a number of subject-matter clinics.